Related Posts in a website/blog are a very important thing as they play a significant role in keeping the visitors engaged on your website/blog. This thing decreases the bounce rate of a website and establishes readership and stability of your website/blog. Attractive thumbnails from related posts is the best way of drawing visitors to more content on your website/blog. So Today we have a list of Eight Excellent Related Thumbnails Plugins For WordPress. Check them out and pick the one that suits your needs the best! Nrelate Related Content is a really nice plugin that display related content from your website/blog. It is great as it analyzes your website’s content and shows other related posts from your website. This thing gets you more page-views and gives your visitors an ameliorated experience. As the name suggests, it display related content from your website/blog in an awesome flyout box. This plugin displays a list of posts related to your current post. It is quite eye catching and allows your visitors to see the relevant which they might be interested in. This plugin provides you a great and fuss-free way of helping your visitors discover more of your content. In this plugin your visitors are recommended related posts from your website through a “slide” at the bottom of the page. 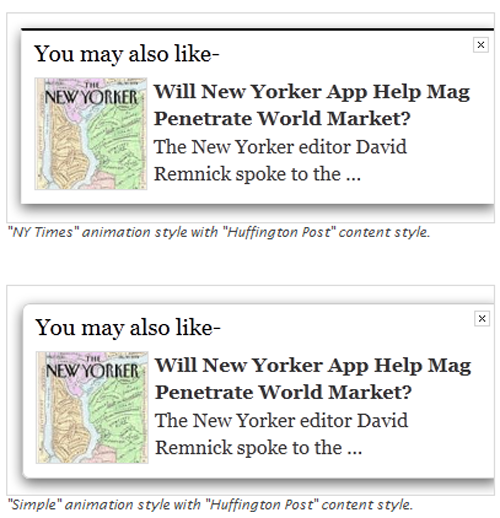 You might have seen this recommendation widget on wesites like NYTimes.com. Now you can also take advantage of this great plugin. This one is a great plugin that that gives you a lot of cool options. You can size thumbnails, choose to display thumbnails horizontally or vertically, select the number of thumbnails, pick a background color, and select font size and color according to your choice and website/blog theme, etc. This plugin is really cool and boasts quite a lot of options. It lets you choose to display thumbnails on pages and attachments in addition to posts, a date function that displays post only after a certain date and setting the number of thumbnails to include. It also provides styling options like choosing the background color and border color, text length, and selecting how the related posts are chosen: by category, tags, categories and tags, random, or custom. You also have the ability of choosing the the source the thumbnails. WP-Thumbie is yet another great plugin that allows controlling the number and size of thumbnails, the length of the text, turning excerpts on or off, including or excluding pages etc. You can also exclude certain categories. This awesome plugin boasts an eye catching slider of the related posts/pages for a WordPress post or page. It is a lightweight jQuery widget. This list included some of the best Related Posts Thumbnails for WordPress available out there. They are extremely simple to use and can be configured from the admin panel.